Despite featuring perhaps the most skin-crawling consensual three-way in mainstream movie history and a rather messy third act, "Get Him to the Greek" is worth the price of admission. 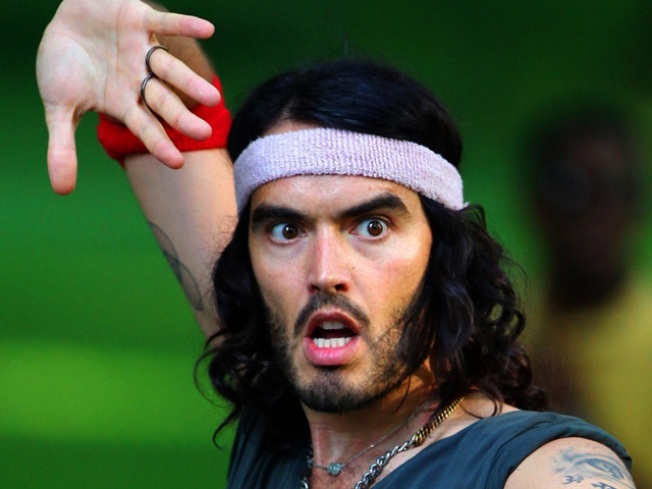 The plot of "Greek" (from our corporate partners at Universal Pictures), such as it is, finds Aaron Green (Jonah Hill) tasked with fetching rock star Aldous Snow (Russell Brand) from London and bringing him to the Greek Theater in Los Angeles for a concert to commemorate his band's legendary live show at the venue a decade earlier. 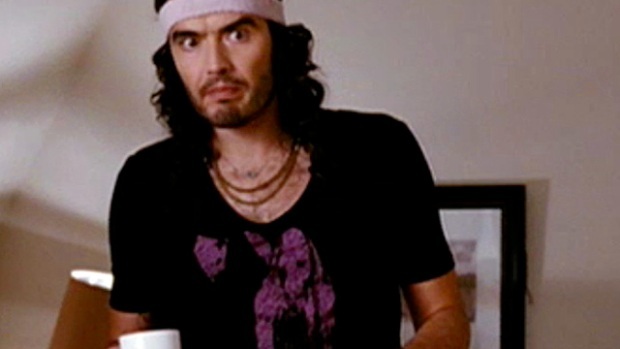 Brand stole all of his scenes in "Forgetting Sarah Marshall," the film that launched Aldous Snow and introduced middle America to the British comedian. In "Forgetting" Hill played a starstruck waiter incessantly fawning over Snow, but Green is a different, if somewhat similar character. Spinning the two off into their own film was an inspired move. Brand and Hill have a nice rapport, developing a natural ebb-and-flow that works, both playing to the other's strengths. There's a great moment when the two are talking at a bar, with Snow saying "Hi" to every beautiful woman that passes by. When one misses his radar, Hill offers a quick, "'Ello, luv" in a cheesy British accent. Snow smiles broadly and points appreciatively at Hill. It works because they don't try get any more out of the bit than there is, never letting it interrupt the flow of the scene. Brand, a real-life recovered drug addict with no shortage of unfortunate incidents in his own past, no doubt brings all his personal history as a petulant, pampered junkie celebrity to the part, and does so to great effect. For all of the first act and most of the second, writer-director Nicholas Stoller keeps things moving briskly along. But when Hill and Brand find themselves in Vegas, the film starts to crawl a bit, as we are suddenly, inexplicably, sent down the path of personal discovery and character development. Part of what makes a film like, say, "The Hangover" so great is the near absence of character arc -- they took a classic premise, and hit you with two hours of relentless laughs. When "Greek" is trying to be funny, it is, but when it tries to be something else -- at one point even dramatic (ugh) -- it's tedious. Mercifully, Sean "Diddy" Combs arrives on the scene to improbably save the day, well, the scene anyway. In fact, Combs (Diddy?) is a pleasant surprise as a just-short-of-monstrously-tyrannical record exec. The part doesn't ask a whole lot of him, but it's right in his wheelhouse. But then, with things apparently back on track, the whole thing goes pear-shaped again. Without getting in to detail, what makes the end so odd is that it's tone is completely different from the first 90 minutes and it doesn't appear to serve any larger purpose -- not even something as mundane as setting up a sequel. Nonetheless, "Get Him to the Greek" is a rocking good time that wisely steers clear of its predecessor (though it does give a perfect "Sarah Marshall" a pitch-perfect wink of gratitude), staking out its own territory as truly funny comedy of a completely different flavor.